Summer in the Baltic states, I had already learnt, is a fleeting thing, and not something that can be reliably linked to the calendar. There was a grey sky in Ventspils. Summer in the Baltic states, I had already learnt, is a fleeting thing, and not something that can be reliably linked to the calendar. That’s why, as I stood in front of yet another unusual fountain on the riverfront, I was trying to find just the right setting on my digital camera that would compensate for Latvia’s lack of light. A head and neck shaped bulge of a statue stood at the centre of the fountain, with dozens of spaghetti-like streams of water shooting out at various angles from its top. Behind me I could hear two local men chatting. Out of the confusion of a stream of Latvian I distinctly heard a familiar piece of techno-babble, the phrase “digitala kamera”, and I turned around in surprise. The younger man on the right looked sheepish, but his older companion seized the moment and said something that sounded very much like a question directed at me. “Ah, I’m sorry…” I began, not having grasped even the simplest Latvian phrase in my journey so far through this land of gentle meadows and soft Baltic shores. The two men switched to English without missing a beat. “My friend doesn’t understand what a digital camera is all about,” the younger one explained. “Oh, they’re fantastic,” I enthused, and turned my camera around to show them the slightly dim photograph of the fountain I had just taken. The older man still looked confused, so I had a second idea. “Just a moment,” I said, and moved back a step to snap a picture of the two of them. They eagerly peered at the screen, pointing to themselves and slipping back into Latvian in their excitement. Both grinned and turned back to me, and the older man translated their jabbering in a single succinct English word. “Splendid!”, he said with a smile. It was true that my brief experience of Ventspils thus far had, in fact, been lovely. My guidebook had suggested a small hotel on the Ratslaukums (Town Hall Square), and I had found it easily after a short walk from the modern bus station. I was delighted to discover that the Rate guest house had in fact been the Town Hall in the nineteenth century, and my budget-priced room actually overlooked the square and the curiously classical basilica of St Nicholas (Sv Nikolaja baznica), Ventspils’ principal Evangelical Lutheran Church. During my stay in Ventspils I would never tire of the thrill of seeing my own hotel room window prominently displayed in museum photographs and postcards depicting the town. 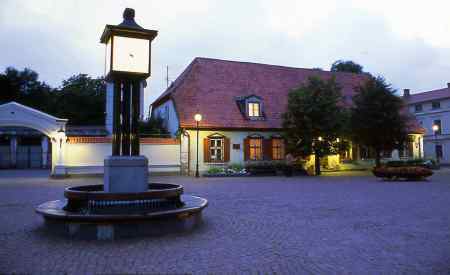 The building is now a budget hotel on this pretty square, with well-kept floral displays typical of the manicured appearance of modern-day Ventspils. I wasted little time enjoying the view from my room, as I had caught wind of a noisy market day just down the street in the market square. I learned this square has been home to the market since the beginning of the seventeenth century, but the modern stalls and storage areas came with a wave of post-Soviet investment. 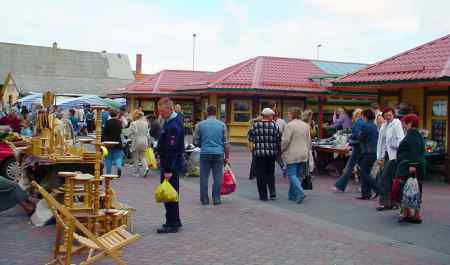 Unlike the rickety tables and ineffective rain covers typical of most eastern European outdoor markets, the Ventspils marketplace had been transformed with permanent buildings in four rows, providing vendors with storage space and a wide veranda roof under which wares of all sorts were displayed for sale: from carefully crafted wooden furniture to cheap clothing, fresh local fruit and vegetables and bargain packs of the chocolate bars known the world over. 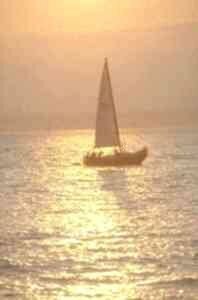 From the markets I had followed a group of local shoppers and reached a wide promenade along a busy working harbour. Rusty but functioning freight ships lined the far side of docks, and I smiled to see one hulk of a Panamanian freighter sporting the peculiarly inappropriate name of Pretty Flourish. On the town side of the long, thin harbour, families and groups of friends were strolling and chatting, and sometimes stopping at a kiosk for a warming coffee. A variety of sculptures and community art projects had considerably brightened up what might otherwise have been a rather unmemorable grey port. It all seemed so far apart from other towns I had recently visited that my camera was getting an intense workout, and this was when my duo of new Latvian friends chanced on the scene. They smiled at my assessment of their town. “Yes, Ventspils is a nice place,” the older man responded. “Well, it is now,” his friend clarified. They explained to me how this particular fountain was just one of many embellishments in modern Ventspils, evidence of recent investment and a renaissance of civic pride with a focus on tourism. In the last few years, Ventspils has developed a fine line in sculpture and street art. It was even the first European city to host one the zaniest of events in the community arts calendar: the cow parade. It is said Ventspils counted its blessings even in the days of the Soviet Union, getting somewhat special treatment due to its useful port, where the Venta River flows into the Baltic. It rarely freezes over. In 1968, the Soviet Union opened an oil pipeline from the Belorussian city of Polotsk to Ventspils, and the Latvian town became the largest oil export port in the USSR. When Latvian independence was recognized in 1991, the mass exodus of Soviet era money and people led to a minor economic crash, but it was not long before the local enterprising spirit got things back on track. Before we parted, the two men offered me their tips for discovering Ventspils, particularly recommending the city’s blue flag beach — they seemed to think it was warm enough to swim. Over the next few days I could not quite bring myself to follow their suggestion, but many other things they’d told me about were worthwhile sights. For a town of less than 50,000 inhabitants, Ventspils’ endless twists and turns in history and the varied experiences I found here were beyond the scope of most guidebooks. 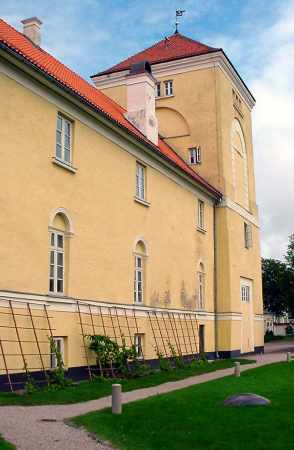 Historians consider a written mention of the Castle of the Livonian Order in Ventspils to be proof that it was the first building in the town, way back in 1290. What I saw of this castle today was definitely the twenty-first century restored version. 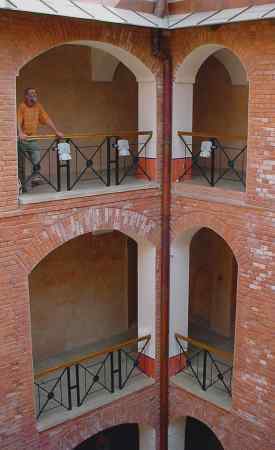 At first I was dismayed that the late mediaeval walls surrounding the courtyard had been supplemented with modern balustrades; but as I explored the castle more thoroughly I understood the intention of the renovators to turn a collapsing icon into a functional attraction, one that carefully preserves elements of Ventspils’ long history. The castle’s chronicle reflects the experience of the town, from its use by knights during Ventspils’ membership of the Hanseatic League, through to extensive damage sustained during the seventeenth century Polish-Swedish War, and then to occupations first by Germany in the early twentieth century, when the castle was used as a barracks, and then by Russians in the second half, when the Soviet Army occupied the castle. The exhibition shows that some archaeological excavation and initial historical studies started during the 1980s, but something of a gap in the historical timeline then suggests an uncertain period following the dissolution of the USSR, until the Ventspils City Council in 1995 took on the renovation project in all seriousness. Grey sky and chilly summer wind aside, Ventspils was a curious mix of old and new, and west and east, a place that deftly proclaims its onetime Hanseatic affiliations as a way of underpinning the entrepreneurialism of the post Soviet era. If I could have given my Ventspils experience a perfect ending, I would have chosen to bump into my camera friends one more time. But as the weekend had rolled into a weekday, the promenaders along Ostas iela had returned to work and I spent my final afternoon alone, taking one last look at the fountains and docks. This time, I knew the spaghetti-head fountain was in fact known as The Ship Watcher, and the strange rocks on blue sticks made up the Seven Mental Meteorites sculpture. What’s more, I knew that if I had another chance to answer the question those two camera-obsessed men had posed about my opinion of Ventspils, this time I would unhesitatingly respond with their own word: splendid! A brief guide to Ventspils.